Figure 1. Female Palmer amaranth plant in Grant County, WI. 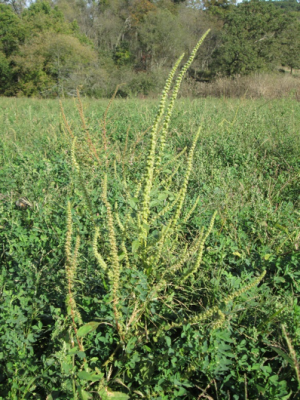 Palmer amaranth (Amaranthus palmeri) has become a challenging weed management problem in the southern U.S. and has recently spread to the upper Midwest (Legleiter and Johnson 2013; Sprague 2013). Palmer amaranth is a highly competitive weed that has become more difficult to manage due to herbicide resistance. Several populations have evolved resistance to one or more of six herbicide sites of action (Heap 2016). Many of the populations in the southern U.S. show multiple resistance to ALS-inhibiting herbicides and glyphosate. The northward movement of Palmer amaranth has been attributed to several mechanisms including the spreading of contaminated manure from animal operations that have fed cottonseed feed by-products transported from southern U.S. production fields, transport of seed on field equipment, and contaminated seed mixes used for prairie restorations. Palmer amaranth is dioecious (male and female reproductive organs on separate plants) and capable of producing 600,000 seeds per female plant (Figure 1). These traits increase the likelihood of resistance spread through pollen and seed dispersal. The first occurrence of Palmer amaranth in Wisconsin was documented in Dane County in 2013 (Davis and Recker 2014). This population was subsequently confirmed resistant to glyphosate (Butts and Davis 2015). Since that time, Palmer amaranth has been found in Iowa (2014), Grant (2015), and Sauk counties (2015). Screening results from the University of Illinois Plant Clinic found that the Sauk County population is resistant to glyphosate. In contrast, research at the University of Wisconsin-Madison determined that the Grant County population is sensitive to glyphosate, ALS-, and HPPD-inhibiting herbicides (data not shown). For Palmer amaranth from Iowa County, we have determined that this population is sensitive to glyphosate (data not shown). However field observations suggested that this population may be resistant to other herbicide sites of action. Consequently, we conducted research to determine the response of the Iowa County population to the ALS-inhibiting herbicides imazethapyr (Pursuit) and thifensulfuron (Harmony SG), and the HPPD-inhibiting herbicide tembotrione (Laudis). Imazethapyr, thifensulfuron, and tembotrione dose-response experiments were conducted under greenhouse conditions using mature seed collected from suspected herbicide-resistant female plants located in Iowa County. A known herbicide-sensitive population from Nebraska was used for comparison to the Iowa County population. Imazethapyr was applied to 4- to 6-inch tall plants at six rates ranging from 0 to 6.25 lb ai ac-1 (400 fl oz Pursuit ac-1, 100 times the labelled rate). Thifensulfuron was applied to 4-inch tall plants at seven rates from 0 to 0.039 lb ai ac-1 (1.25 oz Harmony SG ac-1, 10 times the labelled rate). Tembotrione was applied to 4- to 6-inch tall plants at seven rates from 0 to 0.82 lb ai ac-1 (30 fl oz Laudis ac-1, 10 times the labelled rate). All herbicide treatments included recommended adjuvants. Weed shoot biomass was collected 28 days after treatment. Separate experiments were conducted for each herbicide. The experimental design was a randomized complete block with eight to 10 replications of each herbicide treatment. Each experiment was conducted three times. The effective herbicide dose that reduced shoot dry biomass by 50% (ED50) compared to non-treated plants was used to determine if there was a differential response between the Iowa County and Nebraska populations. The Iowa County Palmer amaranth population displayed a high-level of resistance to the ALS-inhibiting herbicide imazethapyr compared to the sensitive Nebraska population (Figures 2 and 3). At the labelled rate of 0.063 lb ai ac-1 (4 fl oz Pursuit ac-1) rate, most plants (96%) of the Iowa County population survived and grew to an average height four times greater than at the time of treatment (Figure 2). The imazethapyr ED50 for the Iowa County population was estimated to be greater than the highest rate applied (6.3 lb ai ac-1, 400 fl oz Pursuit ac-1 or 100 times the labelled rate). In contrast, the ED50 for the Nebraska population was 0.04 lb ai ac-1. 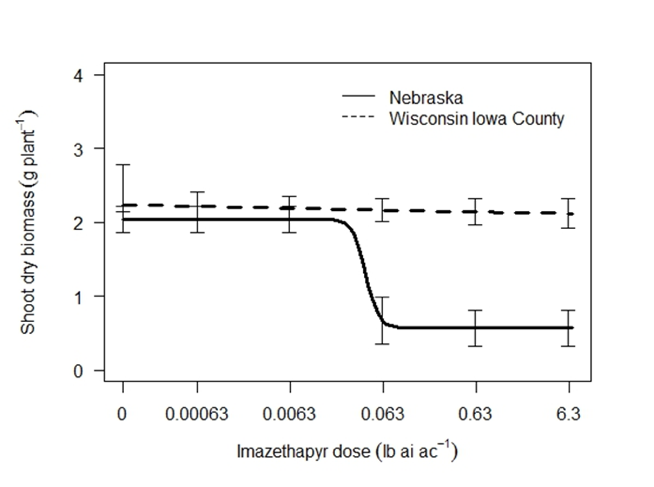 Consequently, the ratio of Iowa County to Nebraska ED50 values indicates a greater than 150-fold level of imazethapyr resistance in the Iowa County population (Figure 3). Figure 2. 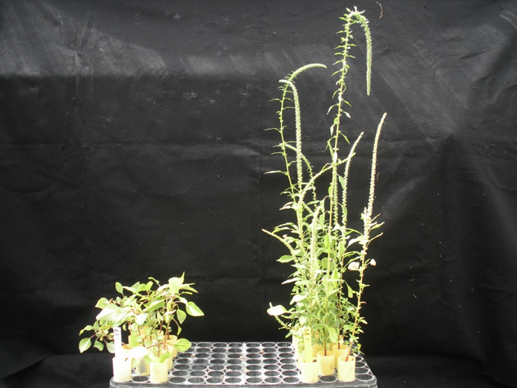 Response of Nebraska (left) and Iowa County Palmer amaranth (right) to 0.063 lb ai ac-1 imazethapyr (4 fl oz Pursuit ac-1) 28 days after treatment. We found that the Iowa County Palmer amaranth showed a low level of resistance to the ALS-inhibiting herbicide thifensulfuron (Figure 4). Thifensulfuron ED50 values were 0.00058 lb ai ac-1 and 0.00012 lb ai ac-1 for the Iowa County and Nebraska populations, respectively. 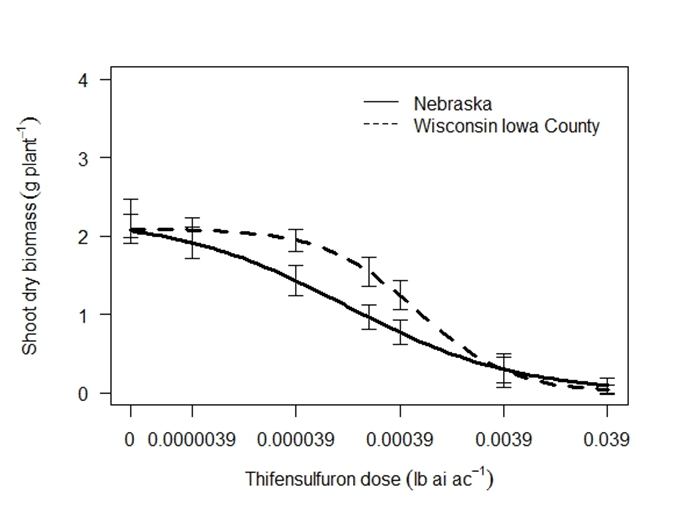 The ratio of Iowa County to Nebraska ED50 values indicated a 4.9-fold level of thifensulfuron resistance (p-value = 0.07) in the Iowa County population. Figure 4. Response of Iowa County and Nebraska Palmer amaranth populations to thifensulfuron (Harmony SG) 28 days after treatment. The labelled rate (1X) is 0.0039 lb ai ac-1. The Iowa County Palmer amaranth population was also found to have a low level of resistance to the HPPD-inhibiting herbicide tembotrione (Figure 5). At the labelled rate of 0.082 lb ai ac-1 (3 fl. oz. Laudis ac-1) 50% of all treated plants survived and grew to a height approximately 1.4 times greater than height at the time of treatment. 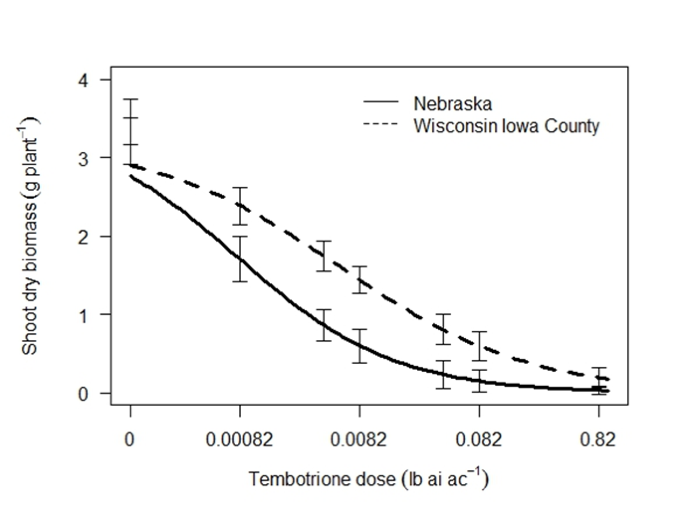 The ED50 values were 0.0056 lb ai ac-1 and 0.0008 lb ai ac-1 for the Iowa County and Nebraska populations, respectively, indicating a 7.0-fold level of tembotrione resistance (p-value = 0.04) in the Iowa County population. Figure 5. Response of Iowa County and Nebraska Palmer amaranth populations to tembotrione (Laudis) 28 days after treatment. The labelled rate (1X) is 0.082lb ai ac-1. These results confirm the first case of multiple herbicide resistance in Wisconsin Palmer amaranth. Although we found that the Iowa County Palmer amaranth was sensitive to glyphosate, this population demonstrated a high-level of resistance to the ALS-inhibiting herbicide imazethapyr, a low-level of resistance to the ALS-inhibiting herbicide thifensulfuron, and a low-level of resistance to the HPPD-inhibiting herbicide tembotrione. At this site in Iowa County, it is suspected that herbicide-resistant Palmer amaranth seeds were transported on field equipment used previously in infested fields out of state. Understanding the biology of weeds present and using a diversified approach to managing those weeds with the intent to prevent weed-seed production. Using weed-free crop seed and planting into weed-free fields. Scouting fields routinely to aid in identifying potential weed management issues. Using appropriate cultural practices that increase crop competitiveness with weeds. Using multiple herbicide sites of action applied at the labeled rates and at recommended weed heights. Cleaning equipment after use to prevent spread of weed-seed from field to field. More information on management of Palmer amaranth and other herbicide-resistant weeds can be found at http://takeactiononweeds.com and http://wssa.net/wssa/weed/resistance. The authors thank Vince Davis and Tommy Butts for previous contributions to this research.